Post processing makes the difference between a snapshot and a portrait. Below are some examples of common post-processing techniques. This article talks specifically about the workflow for weddings, with only minor examples of airbrushing. For a better explanation of the difference between RAW processing only and Fully Retouched photos, check this article on Retouching vs. Color/Exposure. As an expert in the digital darkroom, my goal is to optimize images for printing, to ensure the best possible prints and enlargements. While these differences may be subtle, they are very important in making a photograph ‘look professional’. Professional photographers use something called ‘RAW mode’ when shooting, also known as a ‘digital negative’. Much like the negative in a film camera, this mode stores all of the information that the camera's sensor captures during exposure. In my professional experience, using a variety of film and digital cameras over the last 25 years, Canon and other DSLR RAW modes capture a greater dynamic range than slide or negative film, allowing for a higher percentage of "keepers", or usable photos, from a particular event. Without RAW mode, the camera would make a number of assumptions about the scene, removing that information and presenting it's own version, based on averages and a programmer’s choices. This works in many instances, but it fails in low light or difficult lighting situations like mixed lighting. 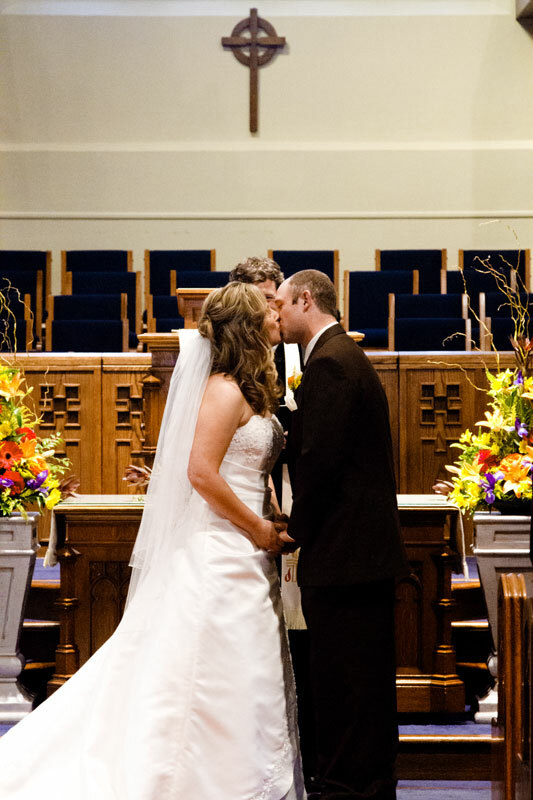 Unfortunately, weddings often take place in these difficult lighting situations! RAW mode allows for post-processing of the image to ensure the best possible exposure and prints. Simply put, RAW gives a photographer much more control over the image in the digital darkroom. Again, the differences may be subtle, but they add up to produce the final image, worthy of enlargement or sharing online. The photo below-left has not been processed at all. This is ‘what comes out of the camera’. The image was deliberately underexposed in order to capture all the highlights of the white dress. A brighter exposure, such as what a camera's automatic settings would yield, would have lost details and blown out the highlights of the image, as simulated on the right. An automatic exposure setting would simply compromise the exposure between light and dark. Whites are blown out and details are lost in shadow. The image below was processed to improve the exposure, without losing detail in the dress or shadow areas. Darker areas were lightened to show details, while the lighter areas also retain their details. Blacks are still black, but there is detail in the shadow areas. Colors were balanced to more accurately represent the scene. In this instance, color balance was shifted slightly from magenta toward yellow for natural skin tones. It would not be possible to correct this without shooting in RAW mode. Hover mouse over the image to compare with automatic exposure. The images below are a small crop of the of the photo above, zoomed in to highlight noise patterns—printed at this size, the full photo would be more than 30x40 inches. Note the noise on the image to the left. The right side has been processed to remove the noise. 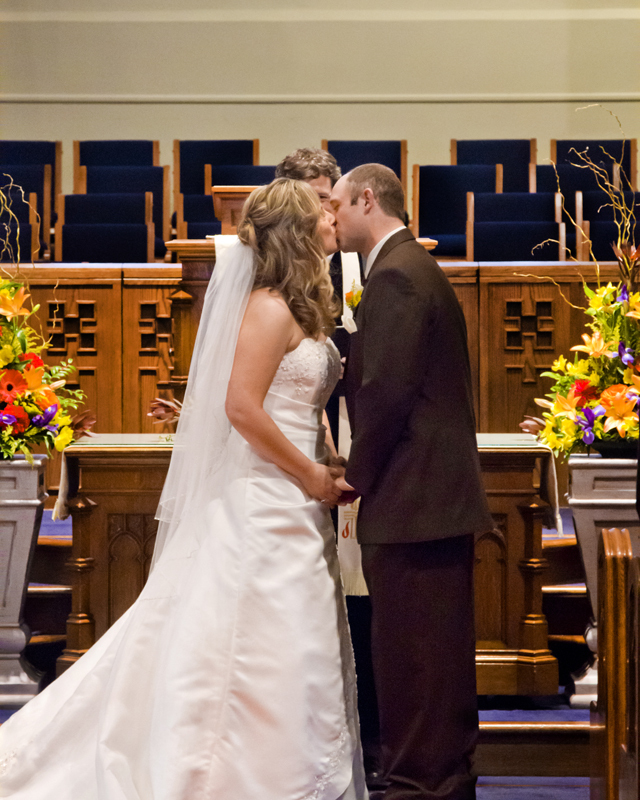 This is common in low-light situations, such as those in a church or a dark reception hall. 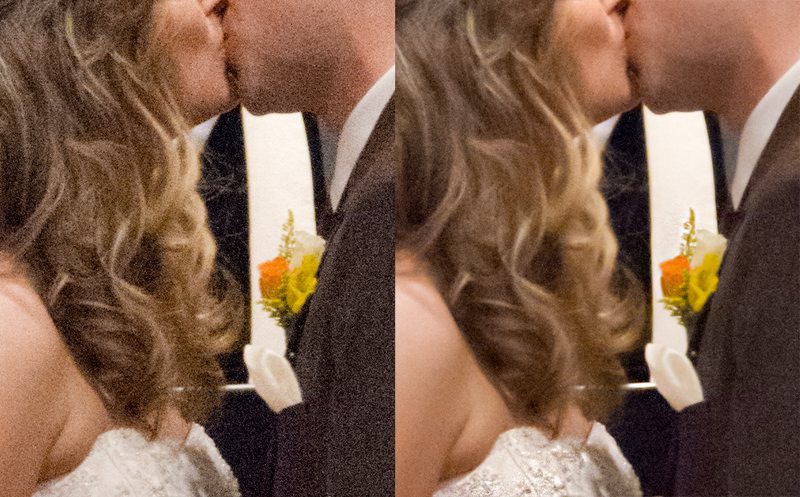 Automatic noise reduction would likely lose all details in the dress and hair. By manually adjusting the levels, noise is significantly reduced without detracting from the details of the image. In addition to noise reduction, manual sharpening of certain details brings them out even more, such as the details of the dress and the boutonniere. Dodging comes from darkroom jargon, where the photographer would ‘dodge the light’ of the enlarger during the printing process. This would be done by hand with a ‘dodger’, usually a circular piece of cardboard on a wire. This would allow more light onto the remaining areas of the print, making the dodged area lighter. Burning is the opposite of dodging, allowing more light to ‘burn’ certain areas of the print in the darkroom while other areas of the image were darkened. Typically, this would be done with the phtoographer's own hands. In the final version of the image, manual burning creates a slight vignette, highlighting the subjects of the photo, which were manually dodged to create a more balanced image. An 8x10 crop creates a more pleasing composition. Manipulation falls under "retouching", as opposed to the rest of this article, which talks about "post-processing" or "developing". For a better explanation of the difference between RAW processing and Fully Retouched photos, check this article on Retouching vs. Color/Exposure. Sometimes, a little white lie can actually make an image more realistic. The eye generally ignores things it doesn't like, such as excessive wrinkles or imperfections in complexion. By using a light handed approach to image manipulation, more commonly called ‘Photoshopping’, an image can more accurately capture the feeling, the memory of the moment, if you will. In this version of the photo, some of the wrinkles in the dress have been smoothed or lightened. 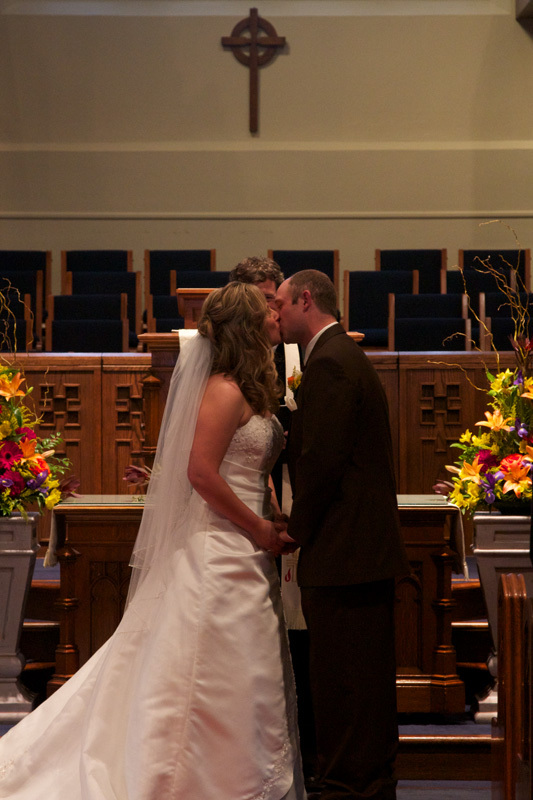 Done correctly, nobody will notice the difference, except to say that it is a lovely photo of the bride and groom. If asked if this is an accurate photo, a witness to the event would likely agree that this is what they saw. Hover your mouse pointer over the image to compare the differences. Black and White photography is not simply the absence of color. In the days of film, photographers would use different colored filters on their camera to adjust the contrast of selected colors, such as skin tones. If captured on color film, filters could be used in a traditional darkroom to modify contrast for select colors in a black and white print. Highlights and shadows were carefully controlled by the artist. The image below and to the left is a typical example of what happens when the color is simply removed. In order to make the skin tones look natural, the image is simply brightened. This washes out the dress completely, and there is too much detail in the shadows. In the version below and to the right, red was selectively brightened in order to have the skin tones match the luminance of the color photo. Green is darkened a bit in order that the flowers do not overpower the scene. True filtered black and white conversion from the RAW image yields details in the dress, natural skin tones, and a high contrast image that matches the color version. Hover your mouse pointer over the image to compare before and after.